Tough times, folks. Like everywhere, people here in the valleys are obviously struggling with divisions of ideology. A perfect time to re-introduce a safe quiet space in my community and the wider world. So I am stoking this collective fire and hoping to do more outreach and activities as the Autumn breaks. Today is raining and cooler and a perfect time to rest in that day coming. Keep watch. Say hello. But more importantly it is a tiny refuge for what is delicate. And we are collecting bits of twine and cotton here to cozy up the place! It is the eve of Candlemas. Did I say that Christmas was over? Well, technically the tide of Epiphany stretches through tomorrow. Go HERE to read and hear this beautiful carol that links the 40th day after Christmas to the 12 days of Christmas. This is why, though some take down decorations at Epiphany, others heard for many years that one just had to have the greens down by the end of January. 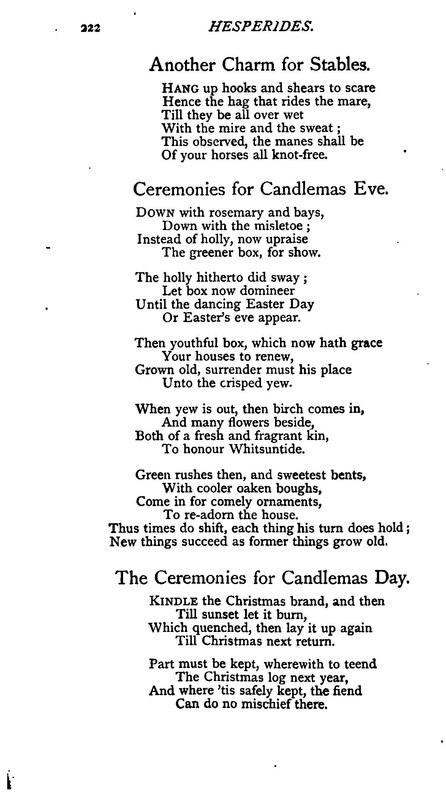 The poet 17th century English poet Robert Herrick expressed the traditions—removing the holiday greens, the coming of Spring and kindling the Christmas wood. This text has been set to music through the years and is a popular mountain carol for the end of the season and you can listen to a brief clip HERE. Being midway between the Winter Solstice and the Spring Equinox, it is now that we truly seek to look to the coming light. From the Scottish immigrants we have a rhyme that references the halfway mark and places pressure on Candlemas to hint at the weather for the rest of the season. Related to the strength of the sun on Candlemas and having already established a penchant in Appalachia for using animals to divine the season and weather changes, an old German tradition took hold in the mountains involving a marmet (“whistle-pig” to us mountaineers) seeing its shadow . . . Even after residents adjusted to and accepted the new calendar, the traditions remained and many still celebrated Christmas in the new year since it helped to separate the holiday from the increasing secular and commercial excess. Along with the pioneers who settled among the Appalachian Mountains came a host of strange holiday superstitions, mostly thanks to the Scotch-Irish and English settlers. Many of the stories refer to events that occur at midnight and involve nature-- roosters crowing, horses switching which side they lie on or talking, bees buzzing, barn animals kneeling and facing East, cattle kneeling and lowing, the Christmas Rose blooming, water turning to blood. In the book, Grandfather Tales: American-English Folk Tales the story of Old Christmas Eve includes a Mummer's Play where they sing "The Cherry Tree Carol." I hope everyone made merry throughout the holiday season-- but tomorrow is the last chance this holiday to celebrate Christmas Morning! First, I have been reading "The Old Magic of Christmas,"
It also has some meaningful and rustic crafts related to each theme. In years past I have read (and reread) "Christmas in Germany: A Cultural History." It explores deeply the history of Christmas in Germany through the 20th century. The early history so greatly influenced American Christmas due to the large number of German immigrants. If you just want to hear and remember tales from Christmas-gone-by in the southern Appalachian mountains, try "A Foxfire Christmas: Appalachian Memories and Traditions." This book started out as an idea for a Christmas card from Doubleday and grew into a rich collection of stories. Finally, moving into the world of fiction, a story from the artist Brom. "Krampus, the Yule Lord" is a grim fairytale (no pun intended) set in West Virginia when a songwriter gets caught in the struggle between Santa and his enemy. The Oh Hellos have created Christmas music. And it is a gift. a balm. a thing of beauty. And you can afford it. Because you can name your price. Things are just beginning here at The Mountain Spirit. I'm Heidi and I hope we can gather together online and near our mountain home to share, celebrate and create inspired by mountain life and heritage. We will be beginning with a Simple Service, a brief time to focus on our spirits and reflect on the season. This is not necessarily intended to replace Sunday morning services, but is offered as a supplement or alternative to your current style of worship. Look for this quiet event to happen in January to welcome the new year and as a reflection on a busy season and a sinking into Winter. The time and place will be announced in the next couple of weeks. If you don't want to miss the announcement, join us on Facebook or contact us and we will be sure to keep you in the loop!